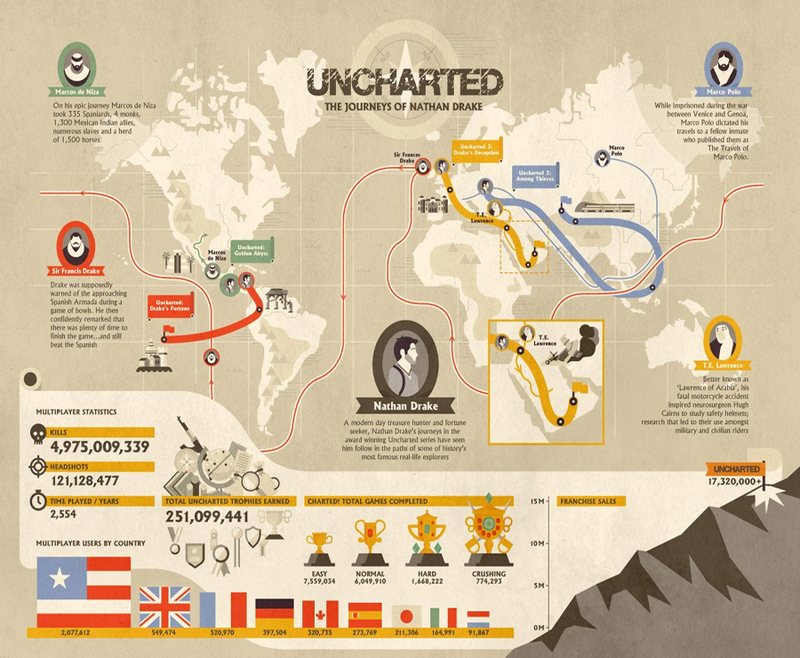 Following the announcement of the Uncharted franchise selling more than 17 million copies, Sony has unveiled an infographic for Naughty Dog's series detailing Nathan Drake's journey and overall player statistics that many gamers might find intriguing. The infographic reveals a slew of intriguing multiplayer statistics accumulated throughout the three main Uncharted games, as well as overall trophy stats. Protagonist Nathan Drake has also been showcased in the image detailing his journey from Uncharted: Drake's Fortune until Uncharted 3: Drake's Deception. You get a nice, full graphical rundown of how the titular hero evolves over the course of the game's illustrious trilogy. As displayed in the infographic, Sony recently confirmed the latest sales figures for the Uncharted IP. It's currently sold 17, 320,000 copies since the first installment that released in 2007. Accompanying the news was confirmation of a Game of the Year edition for Uncharted 3, so gamers will get even more bang for the buck when the GOTY edition releases later this year. The special edition will include all of the previously released downloadable content packs for the PlayStation 3 exclusive.